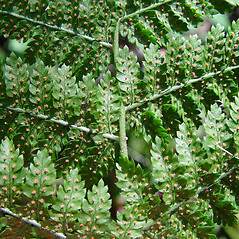 Evergreen wood fern is the only fully evergreen fern with a lacy (at least twice dissected) appearance, and its fronds are in circular clusters. 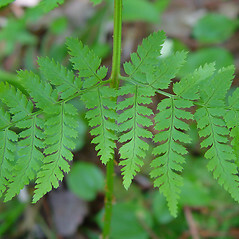 The evergreen leaves are thought to contribute to early spring growth by photosynthesizing before the new leaves have fully emerged. 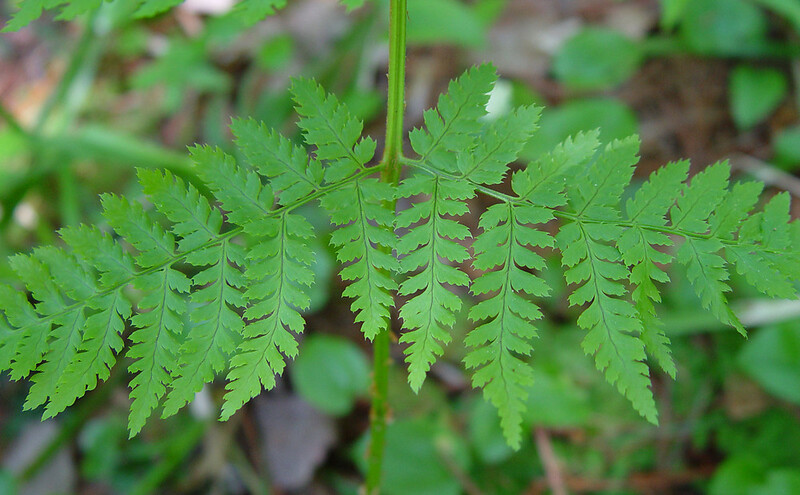 Alternately, they may serve as above-ground storage organs for nutrients. 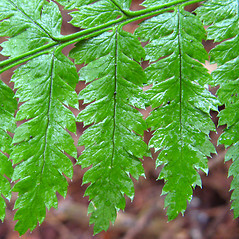 first lower leafule on lower leaflet as long as or longer than adjacent leafule and rachis and midrib of leaflets and leafules without stipitate glands (vs. D. intermedia, with the first lower leafule on lower leaflet shorter than the adjacent leafule and rachis and midrib of leaflets and leafules with stipitate glands). 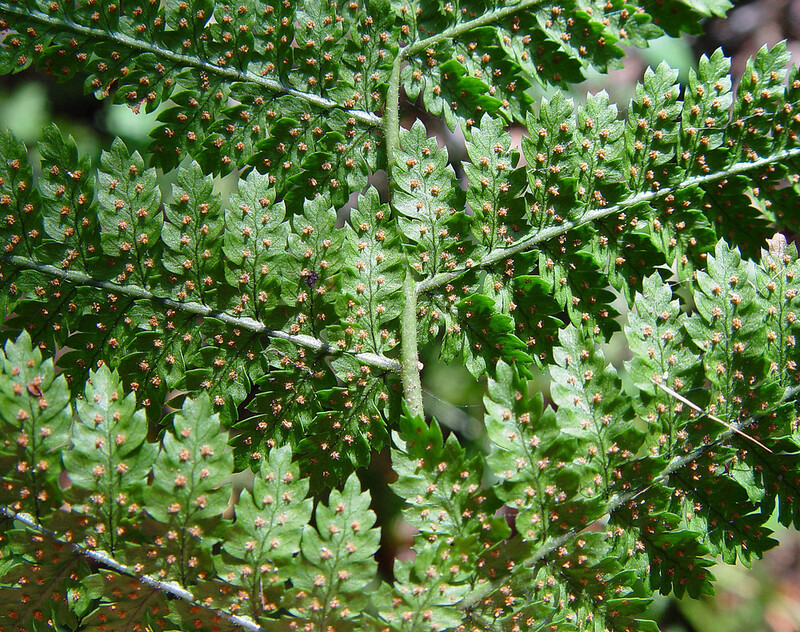 evergreen wood fern. 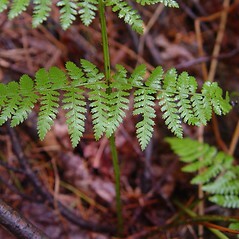 Aspidium intermedium Muhl. 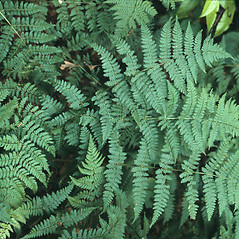 ex Gray; Dryopteris austriaca (Jacq.) Woynar ex Schinz & Thellung var. intermedia (Muhl. ex Willd.) 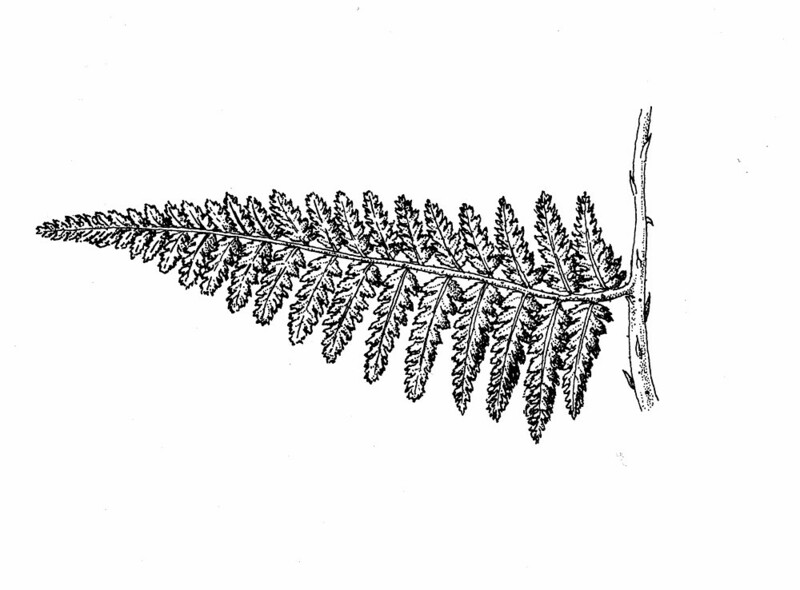 Morton; D. spinulosa (O.F. Muell.) Watt var. intermedia (Muhl. ex Willd.) 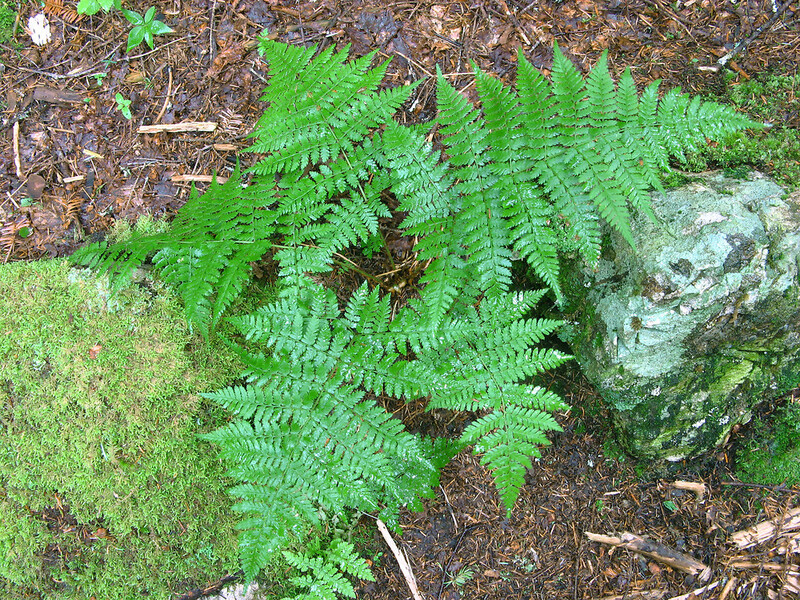 Underwood • CT, MA, ME, NH, RI, VT. Forests, including rocky and high-elevation types, edges of forested wetlands. 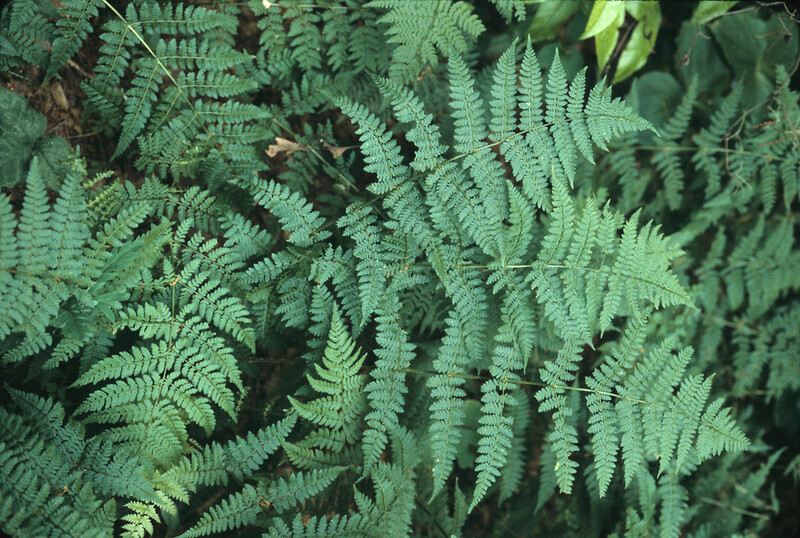 Dryopteris intermedia and D. carthusiana often grow together and are sometimes confused. 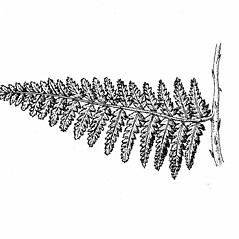 In addition to those characters stated in the key, the two species can often be separated merely by examining the orientation of the marginal teeth. 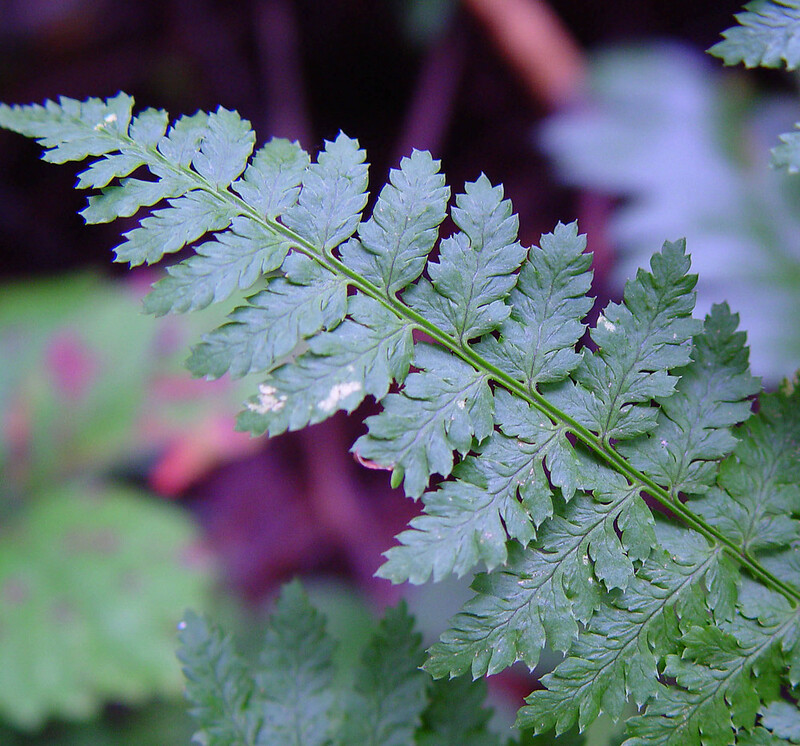 Those of D. intermedia are ± outward pointing, whereas those of D. carthusiana are ± forward pointing. 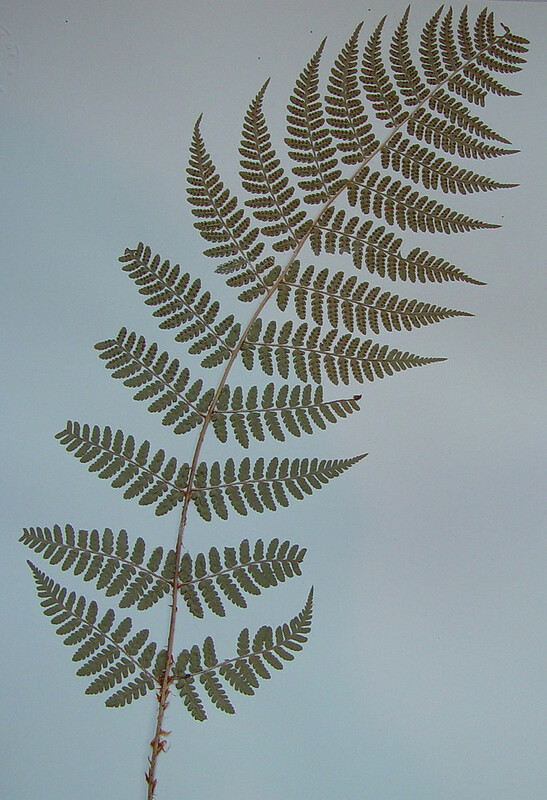 2×8. 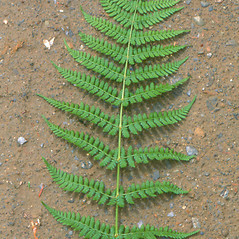 Dryopteris carthusiana × Dryopteris intermedia → Dryopteris ×‌triploidea Wherry is an uncommon wood fern hybrid known from CT, MA, ME, NH, RI, VT. It shows long, often outward pointed, basiscopic leafules on the lower leaflets and ± forward-curving teeth (similar to D. carthusiana), but the indusia (and often the rachis and costae) have stipitate glands, and the leaf blades are somewhat evergreen. 3×8. 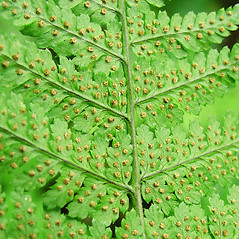 Dryopteris clintoniana × Dryopteris intermedia → Dryopteris ×‌dowellii (Farw.) 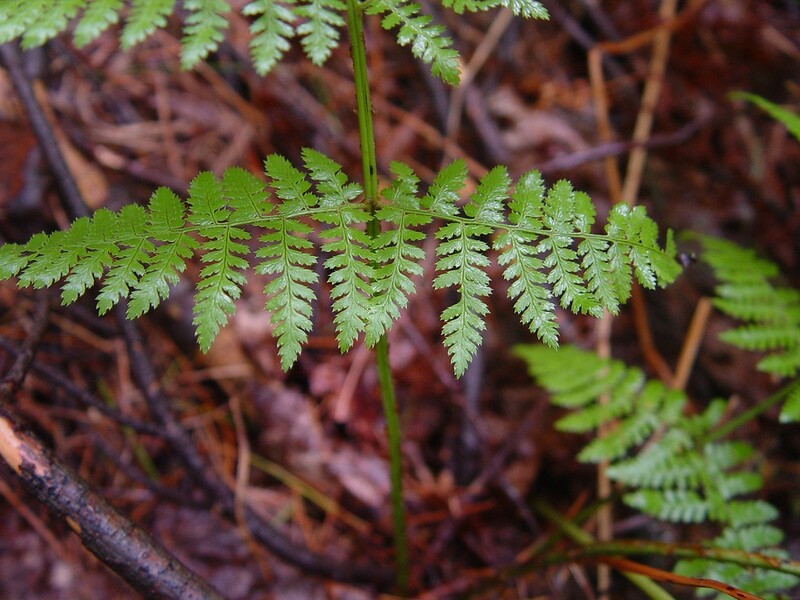 Wherry is an infrequent wood fern hybrid known from CT, MA, ME, NH, VT. 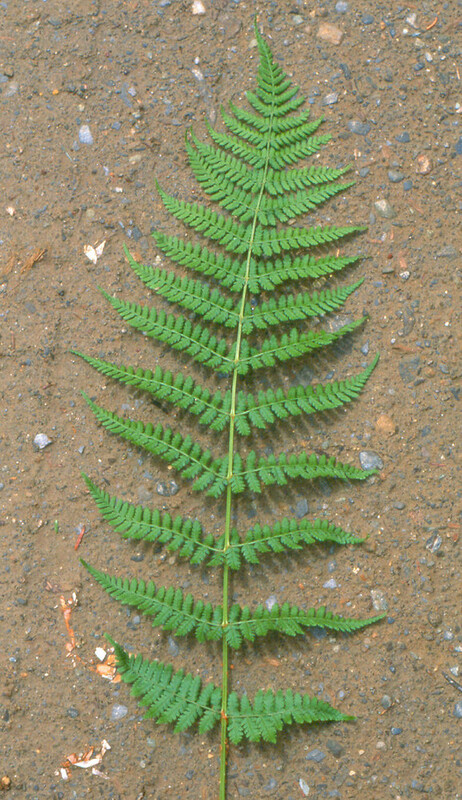 It resembles D. ×boottii (4 ×8) in many features but has broader leaf blades with a more abrupt taper at the apex. 4×8. 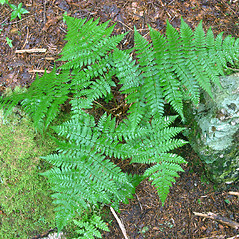 Dryopteris cristata × Dryopteris intermedia → Dryopteris ×‌boottii (Tuckerman) Underwood is a relatively common wood fern hybrid known from CT, MA, ME, NH, RI, VT. 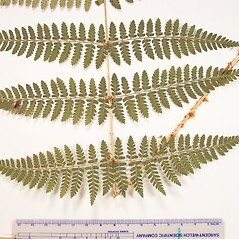 It shows stipitate glands on the indusia (and often the rachis and costae), mostly 2.5 times divided leaf blades with ± parallel margins, triangular lower leaflets, and sori positioned midway between midvein and margin. 7×8. 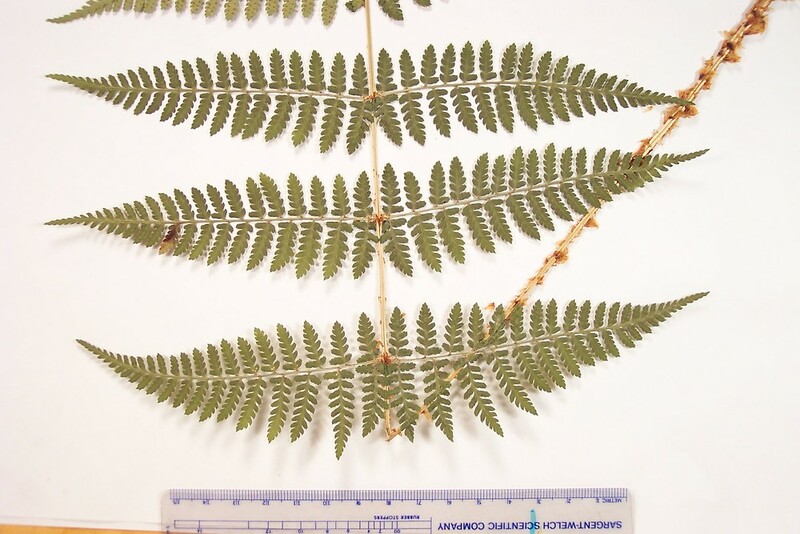 Dryopteris goldiana × Dryopteris intermedia → This rare wood fern hybrid is known from CT, MA, VT. 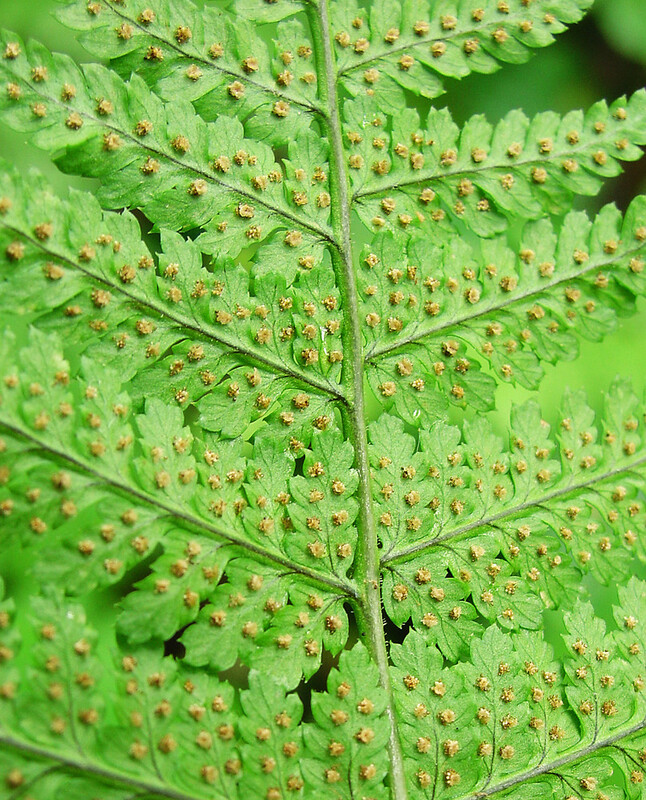 Overall, the nothospecies appears closer to Dryopteris intermedia on superficial examination. 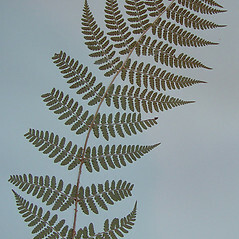 However, it has scales on the petiole that are dark chestnut-brown with broad, paler brown margins (rather than lacking a dark central area as in D. intermedia). 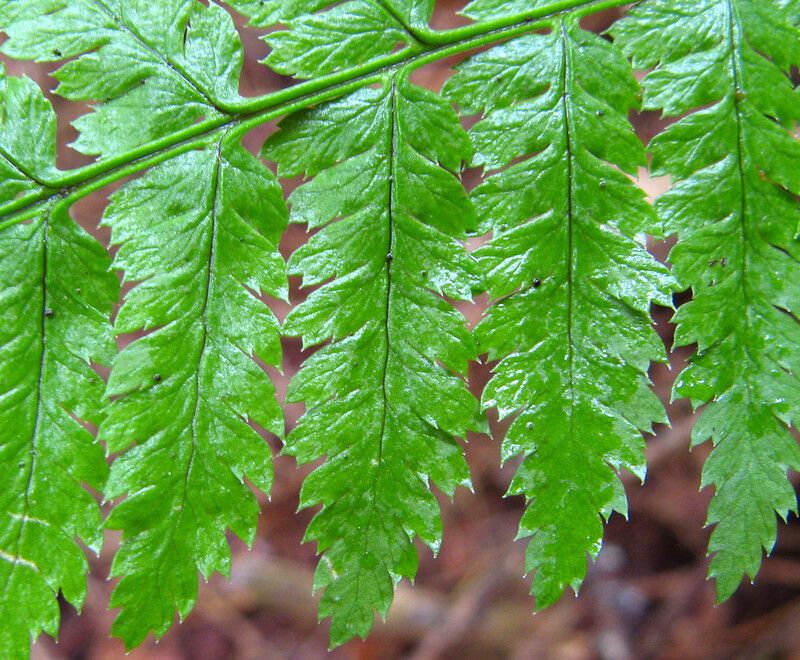 The hybrid is further characterized by leaf blades that are 2.5- to 3-times pinnately compound and mostly 1.8–2.2 times as long as wide (rather than mostly 1.7–2.2 in D. goldiana and mostly 2.3–2.6 in D. intermedia), sori positioned in 1 or more rows along each side of the leafule or lobe (rather than 1 row on each side in D. goldiana and 2 or more rows on each side in D. intermedia), and indusia with stipitate-glands (glands lacking in D. goldiana and present in D. intermedia).